The holiday spirit is in full swing in Kansas City! 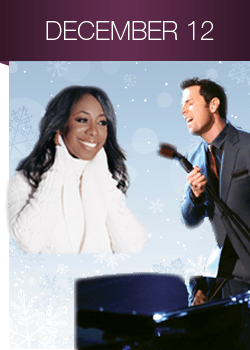 Over a thousand people flocked to the Kauffman Center for the Performing Arts’ Helzberg Hall to welcome home two incomparable local artists: Wichita’s native son and current star of the Phantom of the Opera North America Tour, Chris Mann, and Grammy-nominated singer-songwriter Oleta Adams! Both performers raised their voices for two outstanding charities: The Mission Project and First Downs for Down Syndrome. The Mission Project is celebrating 10 years of helping adults with developmental or cognitive disabilities to live independently. Meanwhile, First Downs for Down Syndrome is a partnership between the Kansas City Chiefs and the community that helps raise funds for both the Down Syndrome Guild and Children’s Mercy Hospital’s Down Syndrome Clinic. As concertgoers mingled in the lobby and noshed on holiday drinks, cookies and cupcake creations, a mother of a Mission Project participant shared how Ms. Adams gave a private concert for the group and had special 45-minute talkback session that perfectly showed the tenacity of Ms. Adams’ character. Chris Mann also mentioned that he admired the enthusiasm for the Mission Project’s participants and dedicated the debut of his new single: “Remember Me,” a rally cry in the fight against Alzheimer’s Disease, to them. During the two-and-a-half hours, the Kansas City Symphony accompanied both artists. Under the baton of the organization’s associate conductor, Aram Demirjian, the ensemble helped the artists take their hits to new heights. The Voice alum opened his set with classic Christmas tunes: “White Christmas” and “The First Noel,” before paying tribute to the Chairman of the Board with “Luck Be A Lady.” He continued his set a piano-heavy cover of Leonard Cohen’s “Hallelujah” that perfectly blended fellow Team Xtina alum Matthew Schuler’s unplugged approach along fellow classical crossover contemporary and America’s Got Talent alum Branden James’s operatic tone. While he shared his disappointment that the Phantom of the Opera North America tour would not stop in Kansas City, he treated the audience to “The Music of the Night.” Mr. Mann easily challenged his villainous alter ego and gave the audience chills. After a brief intermission, Oleta Adams arrived on stage with a thunderous ovation! Wearing a knockout burgundy gown, she stated: “Let’s have some fun!” before kicking her set off with “Rhythm of Life.” Her collaboration with the Kansas City Symphony on Sir Elton John’s “Don’t Let the Sun Go Down on Me” was one of the night’s many highlights as the ensemble transfigured Elton’s small melodies into a booming orchestral and gospel hybrid. To learn more about both The Mission Project and First Downs for Down Syndrome, click on their respective hyperlinks! It must be wonderful as a professional singer and to be winning in the game and big scheme of things! Chris Mann and Oleta Adams put on a wonderful show! I had never heard Chris Mann before, what a wonderful voice, I will now be a follower. I would love to know the name of the encore song that Oleta Adams sang – it was beautiful!